Shape Fitting Technology – it's only air, but what we do with it makes a world of difference. There are no greater defenses against wounds and illnesses than those contained in the human body. But often these defenses need an ally. A partner in the healing process. ROHO DRY FLOATATION technology is that partner. 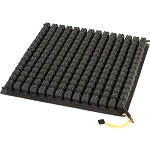 The soft, flexible, interconnected air cells that comprise ROHO DRY FLOATATION products are adjustable to provide a customized fit to a client's sitting or lying shape. 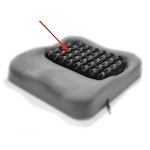 As an individual's body shape changes, the cushion adjusts to facilitate blood flow.